Welcome to the first in the Frog Goose and Bear Real Parties series where we’ll be taking the ‘daunting’ out of at-home parties by interviewing fellow everyday Mums for their party planning tips and tricks. The first cab off the rank is my friend Jane who lives in Hungary (how cool is that?!) and blogs at Mama Pea Pod. Jane is Mum to two girls aged 4 and almost 7. I have been following Jane’s blog for years and she’s a creative, party loving Mum who always inspires! How far in advance do you start planning a party? What are your top 5 party planning tips? 1. Lists! I keep a notebook just for party planning and have a separate page each to plan for food/drink, games/activities, guest list/invitations, goody bags, decorations, shopping list, things to make, thank you notes, etc. so as not to forget anything. 2. Classic party games are always fun and we always include at least a couple – pass the parcel, musical statues, egg-and-spoon races, etc. 3. If you have prizes, make sure everyone wins one by the end of the party, especially for little kids. I always gauge a party’s success by the amount of tears shed – no tears = a successful party! 4. Plan some unstructured play time (preferably outside – even better if you can hold the entire party outdoors!) into the schedule as well as the organised games. For younger children (up to 4-5 years of age), play ‘stations’ set up that kids can wander freely among are better than organised games. 5. Send kids home with a fun goody bag – if they leave happy, they remember the party as a great time! Out of all of the parties you’ve planned, which one was your favourite and why? Oh gosh, that’s hard to choose! Our Mermaid Party (for my daughter’s 5th birthday) was lots of fun and laughs, and we had great fun with the games in particular! Our most recent party, a Dinosaur Party (for my other daughter’s 4th birthday), was really easy to prepare and run and the kids loved it. And one of our earliest parties, a Rainbow Party (for my elder daughter’s 3rd birthday), was so fun to plan and so pretty because it was so colourful! Where do you draw your party inspiration from? I collect pins on my Parties board on Pinterest throughout the year on various themes that look fun. My favourite party blog, of course, is FGB! But really my kids pick their themes from their own imaginations and then I use those as my inspiration source, creating or seeking out food and activities, etc. that fit with that theme and that I know they’ll appreciate. So really my kids are my main inspiration. What is the next party that you are planning at your house? Well, it’s looking like it will be some kind of science fairy party – whatever that might be! – for my daughter’s 7th in June. She likes to challenge my creativity, I think! Thanks so much for being a part of this series Jane! You can find more pictures of Jane’s parties here on her blog. She also ran a wonderful series on her blog entitledABC’s of Kids Party Ideas which showcased lots of different party themes from DIY party bloggers all over the world which you might be interested in if you are having trouble coming up with a theme. Another thing that Jane does that I think is just gorgeous is that she interviews her kids each year on their birthday to capture what their thoughts on life at each age. As well as her blog, you can also find Jane on facebook, twitter pinterest & instagram . Every fortnight on a Friday morning I’ll be asking a different party loving Mum the same five questions and sharing their party pics. In the alternate weeks I’ll be sharing photos and details from parties that I’ve been involved in recently. 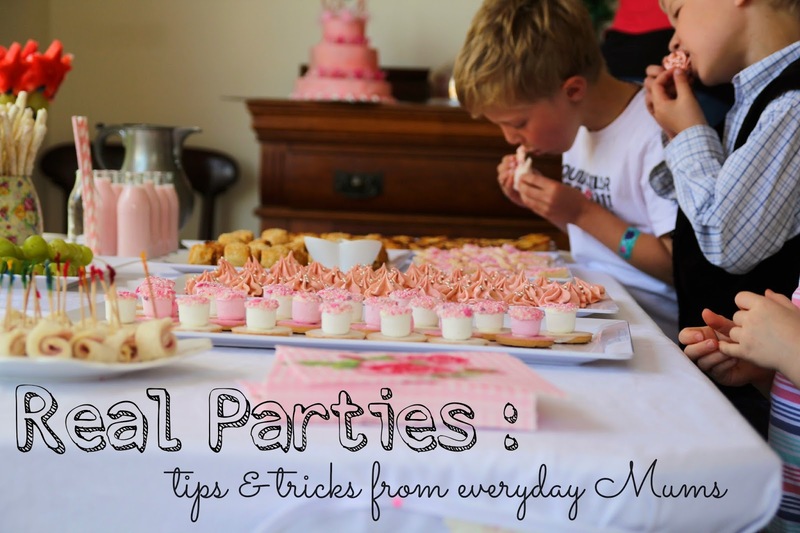 If you’d like to share your party tips & tricks and be interviewed as part of this series, I’d love to hear from you too! I also know that lots of you out there have some awesome diy party ideas yourselves so, as a way of continuing to inspire each other, we’ve started posting DIY party pics on facebook and instagram under the hashtag #diypartyfun. You are welcome to re-tag older party pics on instagram or to post pics to my facebook wall and if you are not on either of those platforms and you’d still like to be involved, you can email me your diy party pics if you like. Every Monday morning, here on the blog, I’ll be posting my favourite pics that you (my lovely readers) have shared!